What Is Otitis Media? Between the eardrum and the inner ear is an area known as the middle ear. This space is normally filled with air but when an infection presents, the air in this space is replaced with a build-up of fluid.Normally due to a bacterial infection, the fluid can become thick and mucous-like as it develops an infection.The area can become inflamed and often encroaches into the eardrum as the infection spreads. Otitis media can either be acute or chronic. Acute otitis media has a sudden onset and is normally a short-lived singular episode. Chronic otitis media is a name given to recurrent infections of the middle ear.Glue ear is a type of chronic otitis media whereby the infection persists or comes back immediately after the last bout. This is particularly common in children and often is a consequence of a common head cold. The most common symptoms of an ear infection of this nature are earache progressing to pain, slight changes in hearing ability and a feeling of pressure in the ear caused by the fluid collections.Young children will often have a temperature and can sometimes experience vomiting and a lack of appetite. Chronic otitis media brings with it the same symptoms but perhaps due to an increasing tolerance to the symptoms, they tend to be of a lesser degree. 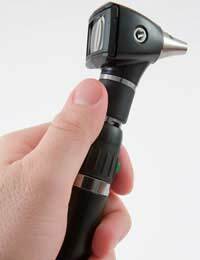 Discharge from the ear is also more common in those suffering from chronic otitis media. Though it was common in the past to seek medical help immediately after symptoms have occurred, physicians now agree that overuse or unnecessary use of anti-biotics can be more harmful to the individual due to the increase in resistant strains of infection to many anti-biotics. Doctors now advise to leave the infection for up to 3 days before seeking medical help. During this time, it is advisable to take paracetamol to reduce discomfort or pain and to help reduce any changes in body temperature due to the infection. Young children and babies will often require regular paracetamol to help control fever and small frequent sips of fluids are recommended in order to help remain hydrated.If the infection is due to a head cold, taking normal decongestants and expectorants is often the best way of treating the illness at home.If symptoms persist, or temperature continues to increase even after taking regular paracetamol, see your GP who will often then decide that anti-biotics are needed.This medication may come is tablet form or as an ear drop. In the case of chronic otitis media, surgery may be recommended in order to drain the fluid from the middle ear. This can be done as a simple drainage procedure or, more likely with children, tubes will be inserted into the ear in order to create a permanent passage of exit for the fluid. Most ear infections are usually fairly harmless and cause no long-term damage, in certain circumstances however, there is a risk of some longer term and more serious implications.Occasionally severe acute otitis media can progress to mastoiditis, occurring when the inflammation and infection spreads to the mastoid bone of the skull.Sometimes the infection or pressure caused by the build-up of fluid can cause the eardrum to perforate, which though normally self-healing, can remain perforated for life. Otitis media is a very common and often non-serious disorder of the ears occurring mainly in children. Symptoms can usually be treated at home using over the counter preparations, without the need for medical intervention.